Casey and I, we spoke the same language. It consists of Vera Wang, Christian Louboutins and Alexander McQueen. She told me from the get go that she loved purple and that her fiance is prepared to be engulfed by purple! However, when she was on a San Francisco trip shopping for her wedding gown, she sent me a picture of her in this stunning deep red Vera Wang gown. Of course I said she HAD to have it, she looked so stunning in it! That was where we got our inspiration for our pops of deep red among the purple. I absolutely loved working with Casey. She has amazing style, and she knew exactly what she wanted. We had such a fun time designing her wedding together! 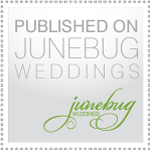 I am still so tickled by all the fun elements that we incorporated in her wedding! Purple sequins, silver studs, lots and lots of purple flowers! Aileen Tran Event Stylist did an amazing job on all the florals and decor. The custom ribbon chandeliers and the over the top decor over the head table will take your breath away!